It is our mission to change the face of ageing and improve the lives of older people across the country. 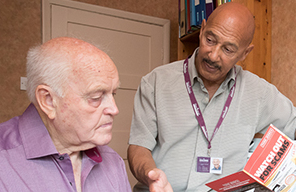 The way we deliver our unique at home care service is one of the ways in which we 'make a difference', but we are also committed to reaching out to the broader community. Through our local offices, we run a number of schemes and initiatives which take us to the heart of the communities we serve. Some see us sharing our extensive expert knowledge and best practice and others simply allow us to spread some happiness. Home is where an older person should feel the safest. Our annual Be a Santa to Senior gift giving scheme sees local businesses and people from local communities come together to help spread Christmas cheer amongst older people.